Daffodils in crystal or glass vases on each end of your mantel bespeak the coming of Spring. Tie a wired chiffon ribbon in a soft spring hue in a bow around each vase for a nice touch. March a line of fluffy chicks across your mantel. Five or more chicks, whether stuffed toys, porcelain hens, or craft store chickens, make a cute display. And speaking of stuffed toys, now is a great time to find those old stuffed bunnies and ducks and turn them into mantel ornaments. Add Easter grass, and scatter decorated eggs along the mantel to keep them company. Bring out your glass, crystal, white, and pastel candle holders of different heights for your mantel. Select a trio of springtime colors such as lavender, pink and eggshell or aqua, pale green, and soft yellow. Use pastel candles in some of the candle holders. 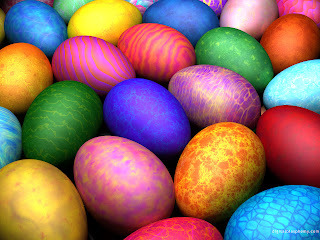 In others, perch decorated Easter eggs (real, plastic, wooden, or glass).